The one that still has a toilet is on the first floor off of the kitchen in the shanty. If you have been following the blog you may remember that the shanty is actually on the demolish and rebuild list. It is slated for Spring 2013ish. The bathroom has wall-to-wall carpet and smells about as good as it looks. It is an interesting combination of mold, rotting wood and really, really old urine. The shanty bathroom is not that bad; when I student-taught in Mexico many years ago I used a bucket over a hole behind a shower curtain at a restaurant, so I compare everything to that. (It is a constant reminder of how much we take good plumbing and running water for granted in this country.) Still, I really do not want to shower in a bathroom that I have to wear shoes in for the next six months. Luckily, the decision to complete the renovation of both floors at once solved our problem. We are going to be installing a new bathroom on the second floor exactly where the old bathroom was. I wish I could show you pictures of the 2nd floor bathroom before we ripped it out, but I did not take any pictures. 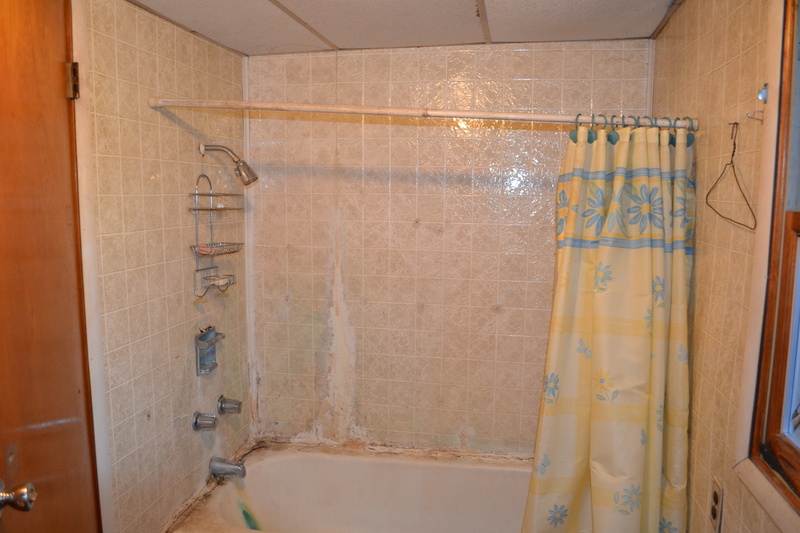 Just imagine a really small, moldy bathroom with a tub that is ready to fall through the ceiling. Speaking of tubs, the hubby and I went back and forth on the tub issue. This bathroom will eventually be dedicated to Maggie and her sibling, if we have another child (NO-I am NOT pregnant). We both agreed we wanted the bathroom to have a double sink; however, adding a double sink where there used to be a single takes up more space. Our original plan was to install a stand-up shower with no tub to save space. As we finalized plans though, I had a change of heart and I decided I wanted a tub. The hubby didn’t. I won. The tub won (reminder: relationships are NOT about competition but compromise). The hubby compromised by moving the bathroom walls and making space for the tub (one more reason why I love him). Now that the hubby and contractors have enlarged it, the size is around 8×8. The pic below is before the wall was erected. You can see how small it was. That is about as far as we have with the bathroom plans; I am working on a floorplan to share with you next week. This bathroom will be the primary bathroom in the house until the shanty addition is complete, and we add on a Master Bathroom. Currently we are spoiled with a HUGE bathroom in our Harrisburg house; transitioning to a smaller bathroom will be a challenge, but totally worth it. (See how our roomy our Harrisburg bathroom by clicking on the link below, it is a Maggie classic. As an FYI-her disbelief in the beginning is because I picked up all the dirty clothes on the bathroom floor). Do you have small children or big children who share a bathroom? What tips or suggestions can you add to our bathroom brainstorm; I would love to hear them! This entry was posted in Uncategorized and tagged bathroom, Ikea, renovations by yrppies. Bookmark the permalink. Yikes. Your current bathroom options are pretty bad. I grew up sharing a bathroom with two sisters and a brother. Double sinks were a must. Plus a good shower curtain so that two (or even three) people could use the bathroom at once. Agree on the shower curtain; at first we were going to do a glass door, and then I realized that would probably be awkward :).